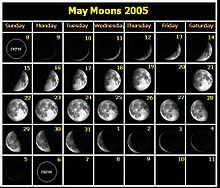 The phase and libration of the Moon for 2013 at hourly intervals, with music, titles and supplemental graphics. उत्तर ध्रुवावरून दिसणार्‍या चंद्राच्या कला ॲनिमेशन स्वरूपात. The apparent wobbling of the Moon is known as libration. The apparent change in size is due to the eccentricity of the lunar orbit. इ.स. २००७ साली दक्षिण ध्रुवावरून टिपलेल्या ॲनिमेशन रूपातील चंद्राच्या कला. अमावास्या' ते 'पौर्णिमा' या काळामध्ये पृथ्वीवरून आपणास दररोज चंद्राचा अधिकाधिक भाग प्रकाशित होताना दिसतो. त्या आकारमानाने वाढत जाणार्‍या आणि त्यानंतर पुढील १५ दिवसांत लहानलहान होत जाणार्‍या चंद्रकोरींना चंद्राच्या कला म्हणतात. उत्तर ध्रुवावरून दक्षिणेस दिसणार्‍या चंद्राच्या अवस्था. A crescent moon above Earth's horizon is featured in this image photographed by an Expedition 24 crew member in 2010. This video provides an illustration of how the Moon passes through its phases — a product of its orbit, which allows different parts of its surface to be illuminated by the Sun over the course of a month. The camera is locked to the Moon as the Earth rapidly rotates in the foreground. या पानातील शेवटचा बदल ४ फेब्रुवारी २०१८ रोजी २३:५८ वाजता केला गेला.